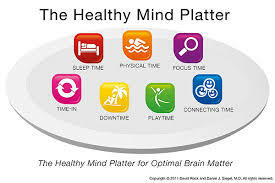 The Healthy Mind Platter has seven daily essential mental activities necessary for optimum mental health. It was created by Dan Siegel and David Rock, two leaders in neuroscience work. These seven daily activities make up the full set of “mental nutrients” that your brain and relationships need to function at their best. By engaging every day in each of these “servings”, you promote integration in your life and enable your brain to coordinate and balance its activities. These essential mental activities strengthen your brain’s internal connections and your connections with other people and the world around you. By adding an eighth ingredient nutrition, I have created a Healthy Mind Platter Wheel which will make a good practical Coaching Tool, which you can access by clicking on the link.